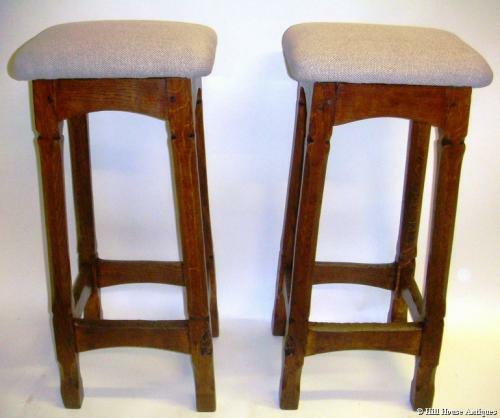 An excellent pair of Gnomeman “pub” tall adzed oak bar or breakfast bar stools with new linen seat covering. Carved gnome signature to legs. These pieces of Mouseman style adzed oak furniture were part of a special commission for a hotel/pub in Filey, North Yorkshire by Thomas (The Gnomeman) Whittaker, c1950’s. The pieces are extremely well made, sturdily constructed and of excellent quality timber & colour. They have lovingly stood the test of time and use. Thomas (The Gnomeman) Whittaker (c1910-1991) lived and worked in Littlebeck, about 5 miles from Whitby in Yorkhire. He was known for only using English Oak and his trademark signature was a carved little woodland gnome into each piece of furniture he made. According to legend, a gnome is born every time an acorn sprouts and that gnome will guard that tree throughout its life! His business ended when he died in 1991 and his workshop subsequently became a private house.